My friend Paul has been successfully fishing for trout these last few months, after most of us have put away our gear. I think the last time I fished was in September, but Paul and our friend Jim have been happily fishing the kettle ponds around Plymouth (south of Boston and north of Cape Cod) right through December. They have been very sucessful. Almost always this has meant fishing in the late afternoon for just an hour or two. To be perfectly honest, Paul has also pointed out that he feels this year's weather pattern (temperatures, amount of sun, etc.) and perhaps a bumper stocking program might also have been reasons for the fabulous fall fishing. This loop-wing adult Chironomid pattern is nothing more than the already famous Griffith's Gnat tied shorter on the front half of the hook with a loop of gray polypropylene yarn to represent the wing, and to add floatation and visibilty to the fly as it sits on the water. 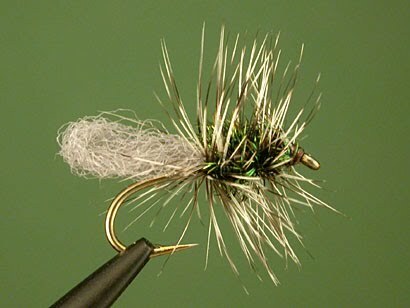 This fly is most effective when fished with little or no imparted motion. If the fish are actively feeding on adult chironomids, they will eventually find your fly. Paul likes it in a size 16, and Jim fishes both 14 and 16.